Laurence Osborn, the 29-year-old composer of this new opera, writes in the programme of the claustrophobia of living with his mother until the age of 25. The libretto, however, has been drawn by Theo Merz from a 1924 absurdist play by the Polish writer Stanislaw Ignacy Witkiewicz, known as Witkacy. The central characters are Leon, an aspiring philosopher, and his mother – alcoholic, an obsessive knitter and a mistress of emotional blackmail. The depth of their bond is explored in one passage in the second act, but the pervasive impression is of cynicism, even grotesquery. 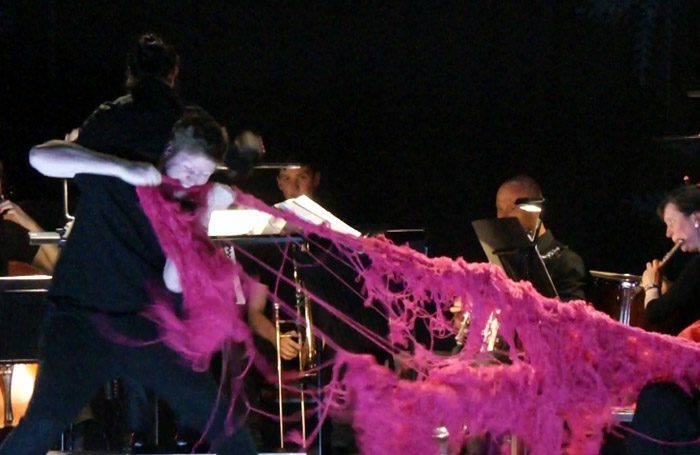 If the action evokes the inter-war avant-garde, Osborn’s music also pays tribute to the 20th century. Intricate, animated and predominantly atonal, it contains snatches of parlour song as the Mother waxes nostalgic, and jazz rhythms flash through its lucid textures. It experiments with the juxtaposition of amplified and unamplified voices, and at one unforgettable moment the cast-members line up and frantically slap out a rhythm on their cheeks. A more sombre, formal mood prevails in the opera’s somewhat overextended third section, an epilogue that turns both surreal and murderous. While they have little opportunity to create rounded characters, the singers are virtuosic and energetic. Praise is due to both them and Theo Merz for the comprehensibility of the (English) text. Frederic Wake-Walker, responsible for the well-drilled semi-staging, ensures that the high jinks remain ironic rather than self-gratifying. As Leon, countertenor James Hall offers both sweetness and strength, while mezzo-soprano Lore Lixenberg fills the Mother’s lines with pungent tone. With the five instrumentalists of CHROMA and pianist Yshani Perinpanayagam on stage, Jamie Man conducts a tight, bristling performance.